10 Days/7 nights: Blessed with a temperate climate, Sydney is Australia’s favorite city with the world’s most beautiful harbor. 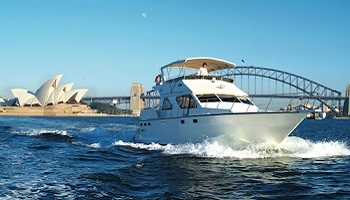 enjoy a city sights tour, morning harbor cruise and tour & dine at the Sydney Opera House. 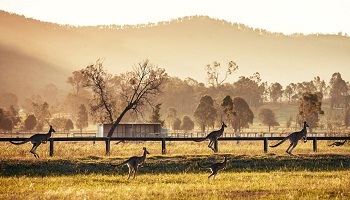 Then on a 3 Days/2 nights small group tour head to the World Heritage Listed Blue Mountains for unique wildlife experiences and dramatic landscapes before continuing on to the Hunter Valley wine region to sample Australia's premier food & wine. United offers daily nonstop service to Sydney from its hub at San Francisco International and Los Angeles onboard the Boeing 787-9 Dreamliner aircraft. Enjoy complimentary food, drinks, adjustable headrest and a personal on-demand entertainment system. Blessed with a temperate climate, Sydney is Australia’s favorite city with the world’s most beautiful harbour. The harbour provides a playground for jet boating, sailing, swimming, harbor scenic flights, dining, fishing, climbing the Sydney Harbour Bridge and sightseeing at the Sydney Opera House. On arrival into Sydney transfer by shuttle service to the Rendezvous Hotel Sydney Central. 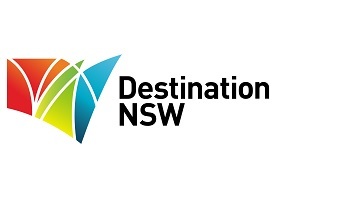 ACCOMMODATION - Stay 4 nights In the heart of central Sydney, opposite Central Railway Station, the Rendezvous Hotel Sydney Central is located minutes from Darling Harbour, Chinatown and the Sydney Convention and Exhibition Centre. The hotel features 116 rooms and suites with modern decor and clean simple lines. Convenient to the transport hub of central Sydney and with secure on-site parking facilities guests can easily explore Sydney's iconic destinations and venues. All rooms feature flat screen LCD televisions, IPOD docking stations, wireless and broadband internet access and reverse cycle air conditioning. 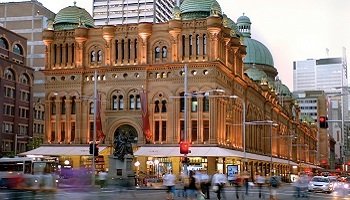 This morning you will be picked up from your hotel for your small group Sydney Sights tour. First stop is Observatory Hill which has a beautiful view of the Sydney Harbour and Sydney Harbour Bridge from the Gazebo Platform. Learn about the arrival of the first fleet and convicts, and see the historic Rocks area. Drive through the city to view iconic buildings on the way to Mrs Macquarie's Chair with views of the Sydney Opera House and Sydney Harbour Bridge. 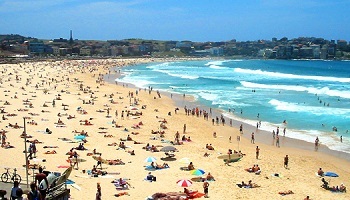 Head to famous Bondi Beach for the opportunity to walk from Bondi Icebergs Club, South Bondi around the Esplanade to North Bondi. Then head to Watsons Bay for views of the city and shimmering water, and South Head. Travel back into the city and cross over the Sydney Harbour Bridge to North Head to view Balmoral Beach and enjoy a leisurely walk. Visit a secret location in Middle Head with amazing panoramic views of all of the Sydney region from North Head to the South including the city skyline. Tour concludes at Taronga Zoo Ferry Wharf with an option of taking the ferry back to Circular Quay or enjoying the rest of the day at Taronga Zoo (entry at own expense). Or re-join your vehicle for transfer back to the city with drop off at Circular Quay or Darling Harbour. 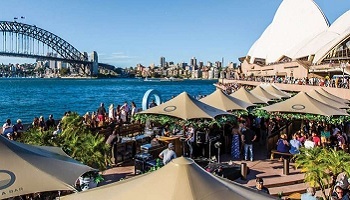 This morning board your Sensational Sydney Cruises vessel at Campbell's Cove Pontoon, Circular Quay, to commence a 2 hour morning Harbour Highlights cruise. Enjoy the company of a small group aboard a 52 foot motor yacht. Your captain and host will share the rich history of Sydney Harbour and its foreshore as you take in the sights of the Sydney Harbour Bridge, the Sydney Opera House and the bays and coves of Sydney Harbour. Enjoy a light morning tea with coffee, tea, juice and water. This afternoon a one hour tour of the Sydney Opera House, one of the most iconic buildings in the world. Step inside and discover the extraordinary stories of this vibrant performance space, steeped in culture and history. Then relax by the harbour in true Sydney-sider style, as you enjoy Australian-inspired cuisine at Opera Bar. Enjoy a full day to explore Sydney at your own pace. Consider hopping on a ferry to Manly and enjoy al fresco dining in this scenic beach community or visit Iconic Bondi Beach and walk the Bondi to Bronte coastal trek or take a surfing lesson. 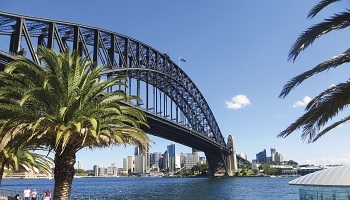 This is the opportunity to climb the world-famous Sydney Harbour Bridge. A comprehensive briefing and safety demonstration is conducted as well as being provided with a bridge-suit, communications equipment and a bridge harness that is linked to a static line throughout the climb. You will be led by one of BridgeClimb's professional Climb Leaders, on a 3.5 hour guided journey (including preparation and briefing), to the top of the Sydney Harbour Bridge. Wearing your flashing Vivid Sydney Climb Vest, you’ll climb the Bridge above the bright, bold and beautiful Vivid Sydney lights before dancing under the stars on our illuminated 70’s style multi-colored flashing dance floor. The Climb takes you along the outer arch of the Bridge on catwalks and ladders all the way to the summit, 134 meters above Sydney Harbour. The steady incline to the summit leaves you free to focus your attention on the surroundings, with the opportunity to witness 360-degree views of Sydney including east to the Sydney Opera House, west to the Blue Mountains and Sydney Harbour surrounds. Upon conclusion receive a photograph of your climb group, a personalized commemorative climber certificate and climber cap. Transfer from your accommodation to Sydney airport by shuttle service. 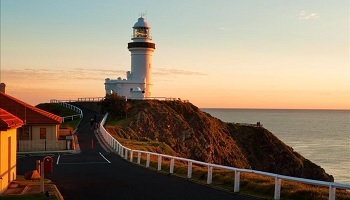 Fly from Sydney to Ballina & on arrival you will be transferred to the coastal town of Byron Bay. This beautiful coastal town and marine park offers the best beaches for surfing and is the most easterly point on the Australian coast. 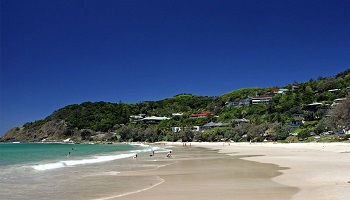 ACCOMMODATION - Stay 3 nights at The Elements of Byron Experience the barefoot luxury of a resort formed from the elements of Byron itself. Elements of Byron Resort and Spa features 103 private beach villas dotted amidst 50 acres of absolute beachfront paradise. The modern Australian beach architecture and interiors are inspired by Mother Nature and this exceptional Byron Bay beachside location, where every luxury awaits. 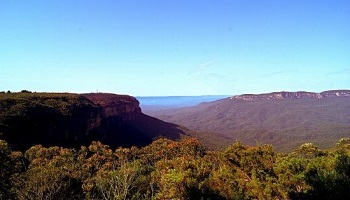 Your informative and knowledgeable guide will collect you from your hotel to commence your small group deluxe tour into the heart of the unique Blue Mountains World Heritage Region. The first stop this morning is at Featherdale Wildlife Park where you arrive early for an exclusive breakfast with Koalas and native Australian animals. 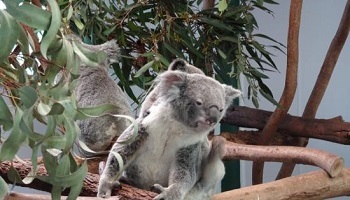 Enjoy a continental breakfast where the animal handler allows guests to get up close and personal with a Koala and other animals...a great experience. Departing from Featherdale, commence the drive to the Blue Mountains via the highway. Visit one of a range of stunning outlooks of the Jamison Valley with beautiful vistas, where possible away from the crowds. Next stop is the remote Eaglehawk Lookout for views of the famous Three Sisters and to hear of the legends behind this famous rock formation. From here transfer to your overnight accommodation by approximately 12 noon. Enjoy the remainder of the day at your leisure. (Lunch at own expense). Overnight accommodation at The Carrington Hotel. ACCOMMODATION - The Historic Carrington Hotel is situated in the heart of Katoomba only a few minutes walk from Katoomba Railway station. Recently restored to its former glory this heritage listed hotel is a local landmark offering the elegance, luxury and charm of yesteryear. One of the few remaining Australian examples of a Victorian Grand Hotel, The Carrington features a magnificent Grand Dining Room, multiple bars and restaurants, luxurious lounge areas and accommodation to suit all styles and budgets. Enjoy breakfast at your hotel. 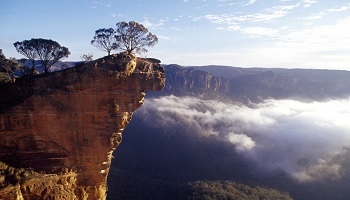 In the morning, travel around the mountains stopping at Govetts Leap for spectacular Escarpment views. Continue to Mt Tomah Botanic Gardens to enjoy a leisurely walk through the gardens enjoying the expansive views followed by morning refreshments. Continue to Bilpin and Wollemi National Park to Putty and then onto the Hunter Valley. 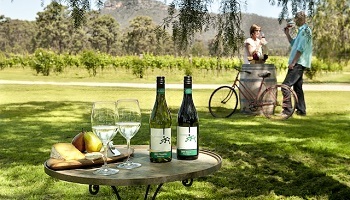 On arrival, enjoy lunch at a Vineyard cafe followed by a visit to a boutique winery for tastings. Enjoy the afternoon and evening relaxing at your leisure. Overnight accommodation at the Mercure Hunter Valley Resort. ACCOMMODATION - Mercure Hunter Valley Resort is located in the heart of the Hunter Valley Wine Region, an easy 2 hour drive from Sydney. The 72 room property has an outdoor pool, tennis court, sauna and spa, and bicycle hire. 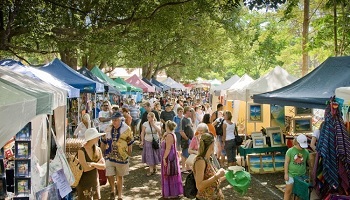 The Hunter Valley Gardens and Shopping Village are just a short walk away. 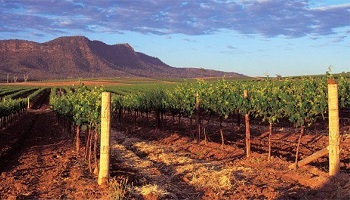 After breakfast at your hotel, there is more time to explore the Hunter Valley before being collected at approximately 11.30am. Head to Leogate Estate for wine tasting accompanied by a selection of cheeses. Then enjoy a relaxing 2 course lunch accompanied by a glass of wine. After lunch, enjoy a stop at the Hunter Village where here you have the options of visiting the Chocolate Shop for sampling and perhaps a decadent purchase or two, explore the boutique shops or enjoy a final wine tasting at the local Cellar Door. From here commence the return journey to Sydney. On arrival into Sydney return to the Rendezvous Hotel Central for your overnight stay (or upgrade to the 5* Amora Hotel Jamison for an additional $50 per person). This morning you will be transferred by shuttle service to Sydney International airport. 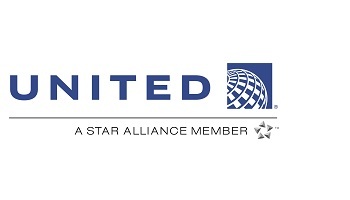 Fly to San Francisco or Los Angeles with United Airlines, arriving the same day. Package pricing is based on double occupancy (2 people sharing a room) for travel 01 April – 31 August for purchase by 30 June 2018; Note: Vivid Sydney festival takes place 25 May – 16 June, for travel outside of these dates a Sydney harbor day time cruise will be substituted in the package. Certain blackout dates apply on the accommodation and tour value add offers - check with your Aspire consultant. Seats are limited and may not be available on every flight. Hotels are subject to availability. All prices reflect a discount for purchases made by cash/wire transfer/check, please see terms and conditions for credit card payments. There are no discounts for payment made by credit cards. Cancellation penalties and other restrictions apply.